On June 8, 1917 – practically two months after the United States’ declaration of war on April 7, 1917 – Chillicothe, Ohio, was selected as the one of sixteen sites for the construction of military training camps. Workers began building Camp Sherman there in late June on a large expanse of farmland in the Scioto Valley. This land was purchased by the United States government with the help of local business owners. The size and scope of Camp Sherman expanded exponentially and the massive convergence of laborers and soldiers at Camp Sherman brought economic prosperity to the surrounding community, arguably transforming the Ross County area. Chillicothe’s population grew from a 16,000 to over 55,000 – numerous new homes and businesses were built and established. Camp Sherman – Hospital Group with Camp in background. This photograph serves as a link to more information on World War I. The Camp Sherman Hospital Group, the base hospital, was established on the west side of the camp and eventually comprised of fifty interconnected buildings including independent laundry, water, and waste facilities. The initial cost of the entire Camp was 4 million, one fourth of which was used for this particular section of the camp. Camp Sherman – Hospital Group, open air medical wards. Dr. Christian R. Holmes was ordered to Camp Sherman on September 1, 1917, being immediately assigned to “the base hospital for [active] duty as chief consultant in otolaryngology.” Dr. Holmes specialized in Otolaryngology and Ophthalmology; he was commissioned a major in the medical reserve corps. Major Christian R. Holmes, Medical Reserve Corps (1917). This photograph serves as a link to more information on Camp Sherman. When the United States declared war against Central Powers, Dr. Holmes had already been preoccupied with overseeing a general hospital as well as a medical college (and later, the development of its new facilities). At this time, he had also been conducting his own private practice started with his associate Dr. D. T. Vail. This practice was known as the Dr. C. R. Holmes Hospital and was originally located on 8-10 East Eighth Street. The hospital was closed after Dr. Holmes’ departure and never reopened; however, despite the overwhelming amount of responsibility, Holmes attempted to maintain his other responsibilities and traveled constantly throughout his service in the military. In January of 1918, he was officially recognized as an active member of the Association of Military Surgeons of the United States (AMSUS). He was given an official certificate now preserved for posterity at The Henry R. Winkler Center for the History of the Health Professions. Scanned Dr. Christian R. Holmes’ certificate of active membership in AMSUS. This image serves as a link to more information on AMSUS from their official website. The majority of information concerning Dr. Holmes’ specific involvement at Camp Sherman unfortunately remains unknown; however, at least some things may be reasonably inferred. Chillicothe experienced an epidemic of Spanish Influenza in the fall of 1918. It is not an outrageous assumption that Dr. Holmes’ was tasked with diagnosing and treating infected soldiers. He must have at least witnessed the city and camp’s quarantine. The Armistice was signed on November 11, 1918; the demobilization and discharge of the military persons at Camp Sherman began almost immediately after. Starting December 11, people began leaving at a general rate of 1,500 per day. Except for the injured, these discharges were completed by July 16, 1920, and the 19th Infantry was tasked with maintaining all of the facilities. Dr. Holmes may have assisted the sick and injured for some time during the demobilization before becoming ill himself. Dr. Holmes died of cancer on January 9th, 1920, after being ill for several months. His dedication to medicine continues to be honored. 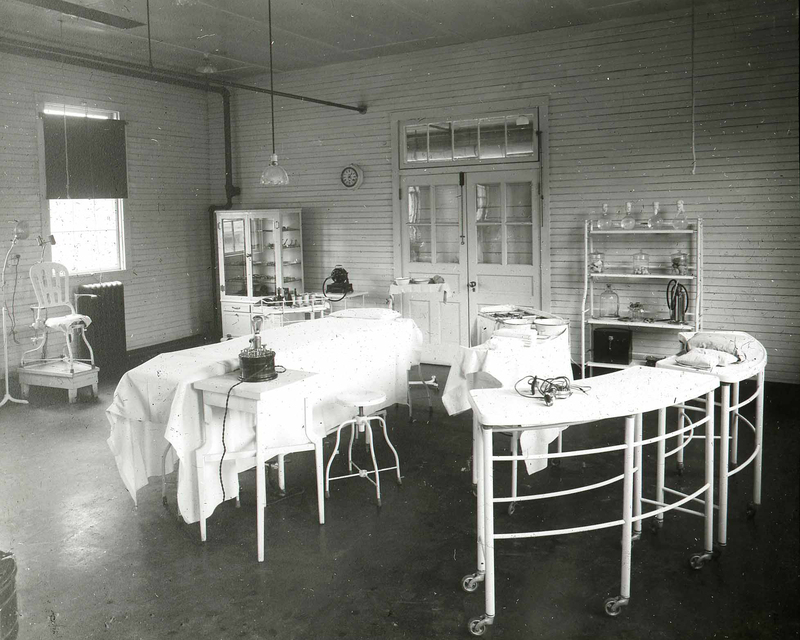 Camp Sherman – base hospital, operating room. Camp Sherman no longer exists as it once did. While part of the camp’s location containing Hopewell Indian burial mounds was declared a National Monument in 1923, a very large majority of the this land was eventually cleared during the 1920’s and 30’s, once again, for the purposes of farming. 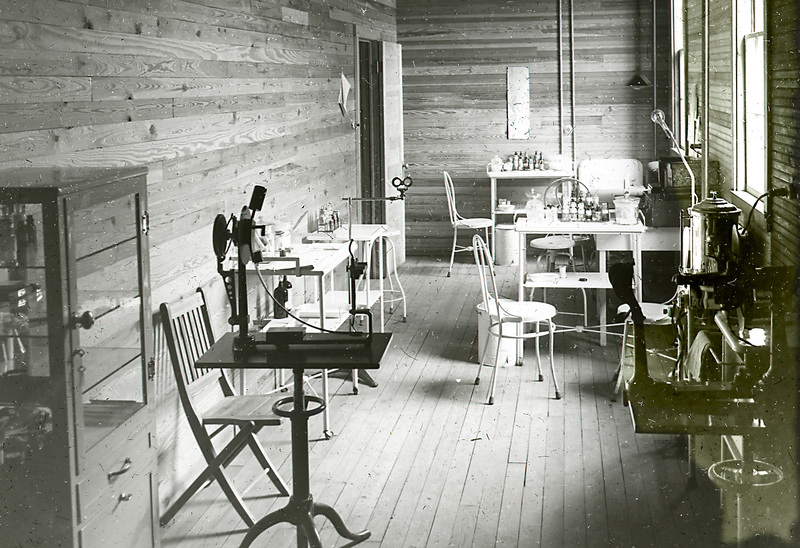 Camp Sherman – base hospital, medical exam and treatment room. A special thanks to Roger West for scanning many of the featured photos as well as for providing a large majority of the sources of information used here.